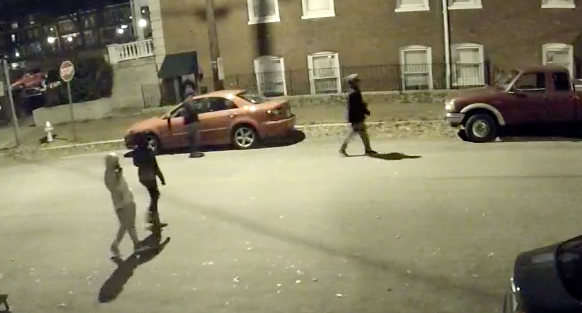 Greater Church Hill Neighborhood Watch posted an alert last night about a group kids “walking blatantly down E broad street and side streets, trying all door handles”. Wonder what made them turn around so quickly and head into Chimbarazo Park? Is there anyway to determine what time this was? Looks like they didn’t find any – good job, neighbors! We shouldn’t be too hard on these kids. They’re probably underprivileged and just shopping for Christmas in the only way they can. Big thank you to the neighbor for catching them on camera! At that hour, the chances of a confrontation are dangerously high. Do the police have the resources to respond if this was called in as viewed here? Would they? What would their response time be? The disjunction here is that there are people in every house in this video awake and probably unhappy that this is happening in front of their house. How can we harness our own energy to make our neighborhood safer? Isn’t there one person in each house in Church Hill that wants this to stop? That’s a lot of energy and will. with all do respect, ann, i understand your empathy, but that kind of attitude enables this behavior. what’s wrong is wrong, what’s against the law is against the law. no exceptions. Frank you nailed it. Would the police even show up and if so what would their response time be. I have been witness so many times to events especially car accidents when I worked in Southside where I called the police and they never showed up that I have given up on them.i had a motorcycle stolen from where I worked on hull street and it 5 days of calling for an officer to come get a copy of the security footage showing the thief. The cop immediately recognized the perpetrator and told me he knew he would never find the guy. One week later I called to check to see if they had found anything and I found out that there was no report filed for the theft. This repeated until finally the third officer came out and filed a report. Our business’ insurance company thought I was trying to commit fraud because the first 2 officers didn’t actually file the theft report I gave them. Ann…come on honey…give it a break. I have an idea. What if everyone committed to sitting on their front porch for 15 minutes a night? Facebooking or what. Many tiny commitments that might make a big difference. And it would be neighborly too. I’ve called the police before and they are pretty quick to respond…. And Ann, please leave your address and liscence plate number in the comments so we can direct these kids to the right place for all their holiday shopping needs. Oh this ticks me off! I called the police a couple weeks ago when I observed this very thing on E. Marshall street and NO ONE came by. I didn’t feel safe to go outside by myself as a single woman. @Justin- I agree that the response of the police in southside is less than desirable. My husband was involved in a hit and run accident near the VA hospital that left him in the ICU for 3 days. The detectives were horrible. I will say though, that the response time of the police in our neighborhood is very good though. I saw 2 people shooting up in a car sitting right outside of my house last year and 2 police cars showed up within minutes. The car pulled away once they saw the first cruiser pull up. The police followed them. @ Frank – I also really like the idea of neighbors organizing so they have more eyes on the street, but I think you also mentioned the possibility of a confrontation due to slow police response times… do you think this would deter the problem from happening in the first place, or do you think it would lead to a riskier situation? Anyone else…? Ann, I appreciate your logic. Do you mind parking in front of my car with your doors unlocked? Mine has presents in the trunk for a toy drive. I’ve had a great experience with our Church Hill police. A few years ago my husband (God bless his heart) left his car door unlocked. WHILE the delinquent was rifling through my husband’s change cup, our thoughtful neighbor called the police, and they arrived and apprehended the criminal WHILE he was still in the car. It was around 1:30 a.m. That’s service with a smile. The kid had just turned 18 years old and I believe he was from the northside area. Thanks again Church Hillian police! Let them try to get into my car. It’ll be the last thing they do. Methinks Ann was being extremely sarcastic, people. Perhaps an earlier or more restrictive curfew law would solve this problem and keep these kids from getting into trouble in the first place? It seems like these kids are never caught in the act and/or they are never identified and/or it takes to long for the police to get there. Perhaps if curfew were set at, say, sunset, or an hour after sunset the police could just detain them on sight, take them home, and charge/arrest the repeat offenders? Obviously, we would need exemptions for kids who are coming to or from a school activity or who work. Perhaps the law could be temporary until this kind of thing stops, or could automatically sunset in a certain number of years. In any event, the community could make it too inconvenient for them to bother with this kind of stuff. And hopefully prevent them from getting mixed up in more serious crime. #7- I think Ann’s comment was fairly dripping with sarcasm. No sympathy here. Also thought it’s lovely that the two look-outs at the back are girls. Little do they know that they’re the most likely to get caught…it’s only a matter of time until they are. it’s a little eery how organized they look. curfew isn’t worth a thing unless it is enforced. In my experience, the police have been amazing in the Church Hill area, especially on Broad. I constantly see police vehicles driving through. I’m all for being aware and working together, but I do think these types of things happen fairly infrequently. And, locking your car doors is city rule #1. Frank, Mister et.al Ann was joking. Lighten up. Sad but true for the city- anything not locked is free game. Drive by Creighton or mosby, no one has anything outside except trash and decrepit chairs…. Sorry Frank, I mistakenly singled you out. I too worry about escalation, especially in light of violent overreactions around the country. Confrontations between kids and police could easily get out of hand and and one mistake and a video camera could bring a lot of unwanted attention to cultural divide of Church Hill. It could happen anywhere. So one thing I’ve started doing, when I get home from work, is just driving my car around the block and through the alley. Like my own mini patrol. I’m going to put some empty boxes filled with bricks and dog poo in the front seat of my car unlocked, along with a GPS sensors so we can track these A holes down…. You can get the GPS modules for like 30 bucks! I’m getting my cameras set up this weekend! #20 – Lee, this is America you know. A sunset curfew for anyone who looks like a kid is an….interesting suggestion. But then there’s that whole pesky freedom thing to deal with. How about we lean on good ‘ol innocent until proven guilty, let people walk the streets, and only have police stop people who have committed crimes? Really are you serious? Let me guess you just moved here from Boston 2 months ago and have no idea of the progression of this part of the city since the 80s and 90s. The culture of theft and general lawlessness up the hill depresses the heck out of me. I definitely think that if someone were sitting on a porch these people would not be trying the doors. I don’t think that a confrontation would ensue in that case. Just your presence on the porch is worth a lot I think. The concern in my comment was about an unintended confrontation which could lead to surprised and violent reaction from either side. Also I want to support the police that work in Church Hill, and the ones I’ve met have been really great. I was just say that potentially they don’t have the manpower or the mandate to speed over. I wish they did have the manpower and the mandate from the people to be present when required. But I honestly think that if we all are present on the street a lot of the opportunity would dry up. Just saw a very similar looking group of kids trying car doors on 30th St. heading towards Marshall / Chimbo Park area. Call 911 non-emergency if you see em, hopefully they get chased down tonight. I’m about to go jogging. I’ll call it in if I see em. Yes, church hill is right down the street from public housing. And in a city where crime is rampant. Do you feel you are more entitled to police presence, than say a less affluent neighborhood? You live in / on the urban frontier. Be aware of your surroundings. You do not live in a suburban neighborhood that is isolated from the problems the city has. Somebody must’ve called. There were plenty of cops out around Broad and Chimbo. I didn’t see them. Frank, wasn’t there some call not long ago for volunteers for crime watchers in Church Hill? Whatever happened with that? Also I had suggested Guardian Angels who have branches in Richmond so why not Church Hill? The concerns you mentioned are important, but this problem seems to be out of control. That’s why I suggested that if such a law were to be passed, it should have a sunset date – a point where it automatically expires and has to be passed again. This forces the issue to be revisited and offers an opportunity for the law to be improved upon or for a different strategy. Or if the crime problem has gone away, then the law need not be renewed. Obviously, I’m open to any better ideas, I realize a strict curfew has it’s flaws, but I do think this could be a good tool for police to address these problems which might keep these kids from progressing to more serious crime. I agree that it’s annoying, inconvenient, and maybe a bit illiberal – but it still seems like an improvement over doing nothing. As for being stopped for “looking young” – and? If you can properly identify yourself and don’t have any warrants out against you, who cares? Maybe it’s a bit alienating, but again I feel like that speaks to the need to find some way to solve the underlying causes of these problems so that these sorts of enforcement measures become unnecessary. Regardless, I really like the idea of at least one neighbor on the porch watching, on every block. I love to do some porch sitten’ but it’s a little cold this time of year.